That's why we must prevent the authorities from promoting war and killing. How dare they promote violence and then tell us they're trying to stop it? They are not trying to stop it. Why are they not leading by example? Because violence does not win and leads straight to Domestic Violence. 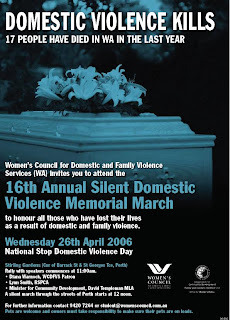 The Domestic Violence Memorial March was started in 1991 by a group of women survivors who were outraged because the criminal justice system often failed to provide legal protection for women and children who died as result of domestic and family violence. The two girls were 16 in June last year when they put a cloth soaked in chemicals over the face of 15-year-old Eliza Davis and strangled her with a piece of wire. Her body was found in a shallow grave underneath a house in Collie, in south-west Western Australia, in June last year. The court has been told the pair have shown a complete lack of remorse and emotion over what has been described as a sadistic, callous and cold-blooded murder. The girls have provided no explanation for the murder, other than telling police it felt right, even though they knew it was wrong. Today their lawyers submitted that both girls had troubled upbringings. One had not dealt with the tragic death of her mother while the second fell into the so-called 'goth' culture and had a preoccupation with death. Outside the court, one of the police officers who worked on the case, Detective Senior Sergeant Steve Post, said the case highlighted a disturbing trend in society. "We've seen in recent times where young girls are taking the lives of others - I just wonder what we're exposing our children to in this society when things like that happen," he said. Eliza Davis's father, Steve, said the girls had shown no remorse. "I can't see any option for the judge except to give them a good long sentence," he said. Prosecutors have called for the girls to be given life imprisonment when they are sentenced next month.